After nearly a year of discussions and negotiations with neighbors and the city, Whole Foods Arabella Station will now be able to stay open an hour later on Sundays and display plants for sale on its front patio, with the official approval Thursday of only the least controversial of its requested changes to its operating agreement with the city. Specifically, Whole Foods will now be able to stay open until 9 p.m. on Sundays — matching its closing time the rest of the week — with the condition that it finish all its exterior maintenance and cleanup by 10 p.m. nightly. The store can also display plants, flowers and pumpkins for sale along its Magazine Street side, but no more than four feet out from the front wall. The store had requested an increase in the number of 18-wheelers allowed to make deliveries per day from one to four, and an extension in the deadline for deliveries from its present cut off at 11 a.m. to a later time of 3 p.m. Those changes, the store has argued, would have the effect of decreasing the amount of deliveries from smaller trucks, as well as spreading their arrival through the day to reduce congestion. But Councilwoman Susan Guidry, whose district includes the Whole Foods store, said she found the extended loading times unnecessary, because the store already has to do most of its loading before its 9 a.m. opening to avoid shutting down parking spaces around the loading bays. She also sharply rejected the request for more 18-wheelers. Guidry had recommended allowing a fifth request by Whole Foods, permission for live music at the store, with the specifications that the performances must obtain special permits, be finished by 6 p.m., and not take place more than 20 times per year. Facing strong opposition to any concessions by the neighbors who spoke at Thursday’s meeting, however, the other council members balked, noting that no other groceries around New Orleans have music performances either. The hour-and-a-half of debate over the project Thursday followed similar lines to previous appearances over the past year before the Audubon-Riverside Neighborhood Association and the City Planning Commission. Whole Foods argued that the changes were necessary to accommodate an unanticipated volume of customers since it opened in late 2002, with attorney Stephen Hanemann saying sales in 2003 were 30 percent higher than projected, and that they have increased by 45 percent since then. “Whole Foods is only asking for what it absolutely needs to meet the needs of the community,” Hanemann said. Neighbors countered that the store has not followed the initial conditions well, and that the changes would allow future tenants even more latitude for negative impacts. Robin O’Bannon, who has been one of the most vigorous opponents to the Whole Foods requests consistently throughout the year, told the council she had collected a petition of 250 neighbors against the changes. Led by Guidry, the council members opted for a middle path, praising Whole Foods for its success but saying that the neighborhood itself has not changed enough since the store’s opening to warrant much change in the operating conditions. As they have done in denying previous land-use requests for a the Gabrielle restaurant and Japanese grocery and coffee shop, the other council members bantered about the neighborhoods that would be most receptive to a second Whole Foods location. Stacy Head pitched O.C. Haley Boulevard, South Claiborne Avenue, or Canal Street; Jon Johnson offered New Orleans East; Kristin Gisleson Palmer and Jackie Clarkson suggested Algiers. “We have everyone driving to one location,” Palmer said, noting the environmental impact. 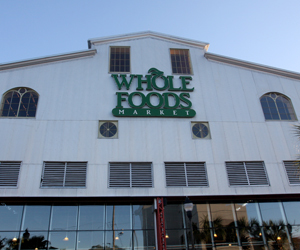 The competition for Whole Foods’ customers may be about to get much stiffer. Costco is considering a store on South Claiborne Avenue, and as a top retailer of fine wines, may draw some of Whole Foods’ shoppers. Elsewhere in the city, actor Wendell Pierce is a partner in developing Stirling Farms, another grocery focusing on fresh food. And Councilman Jon Johnson hinted that another major competitor to Whole Foods may also be looking at New Orleans. I was looking for your live streaming yesterday and didn’t see it, so I just watched the council meeting online and was wondering about something I heard toward the end of the whole foods discussion. What did Guidry mean when she said something about “caving in”? Who to? The neighbors who are most impacted by the store’s operations? Or the other council members? Or whole foods? Maybe I need to watch it again. Does anyone else know what I’m talking about? Justin, she is a moron. I will bet you she claims the neighbors caved in. She doesent want any buisnesses in this area. She only cares about you if you have a vote. It’s the usual step by step process by the business wanting the variance. Get your foot in the door and keep pushing it, until the door is knocked down. The City seems to have no respect for the residents anywhere along Magazine Street to allow significant variances to happen. Agreed. Big businesses are killing the residential neighbords all along Magazine and Mitch and his city council could not care less. Yet one more reason to exit to another parish. Northshore looks better and better.